After uninstalling a Nikon software application from Microsoft Windows some associated files remain on the operating system. Running Regsweeper will completely uninstall all files installed by the Nikon software including the registry keys. 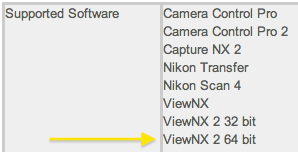 In some rare cases when trying to re-install Nikon software some problems may occur. Running Regsweeper to ensure the system is completely clean of all previously installed files for that application will ensure there are no issues. User deletion of the registry files is not recommended as it may cause further problems, Regsweeper automatically removes these files cleanly. Supported software: Camera Control Pro, Camera Control Pro 2, Capture NX 2, Nikon Transfer, Nikon Scan 4, ViewNX, ViewNX 2 32 bit, ViewNX 2 64 bit.